Every collection (or portfolio) needs a centerpiece that stands out above the rest and recalls a one-of-a-kind story of American history. If you were to start an art collection, wouldn’t you choose a centerpiece that serves as a basis of comparison for the rest of the collection? Well, you’d do the same thing for a rare coin portfolio! Whether it’s a 200+ year old piece of early American gold, a gem quality first-year-of-issue, or a rarity from the Carson City Mint, it’s the great pieces that make a portfolio unique…and profitable. Our rare coin expert Douglas Winter hand-selected each of the following five coins exclusively for ASI readers. His selection process is meticulous, and he only chooses true masterpieces. Doug is one of the world’s leading experts on pre-1933 U.S. rare coins, and he has spent most of his life studying numismatics. The following five coins have been selected, as they represent, in our opinion, the type of coins that will exhibit continued high demand in the coming years. They are popular coins from leading mints in sought-after series. We believe these three factors create the ability for these coins to become the centerpiece of a great collection. Remember, these coins are a true example of “rare coins,” of which only one of each is available. Once these coins are sold, they typically disappear into collections for decades and then come up much later at estate sales or auctions. If you are interested in securing any of these coins before they vanish for years, contact your ASI representative at 800-831-0007 as soon as possible. We are also glad to provide you with suggestions on other pieces that might suitably compliment your selection. This numismatically significant issue is both a one-year type and a first-year-of-issue. The 1854-S dollar is seen from time to time in the lower Uncirculated grades, but it is very rare in MS64 and above. We are aware of just one in Gem quality (the fabulous PCGS MS65+ that realized $56,400 in the Duckor sale, held in August 2015), plus as many as four or five in properly graded MS64. This wonderful borderline Gem is fresh-to-the-market, and it is most notable for its stunning color, which features drips of fiery reddish-gold on the obverse and the reverse. The strike is as sharp as one could hope, and, were it not for two tiny parallel lines at Liberty’s nose, we believe this piece would have graded MS65. A CAC-approved PCGS MS64 sold for $14,100 at Heritage 2016 ANA: 4251, but, in our opinion, it was nowhere near as choice as the present piece. 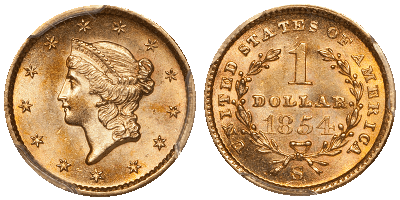 If you collect San Francisco gold, or if you specialize in gold dollars, you will recognize the significance of this wonderful little coin. CAC has approved three in this grade with one finer (MS65+). 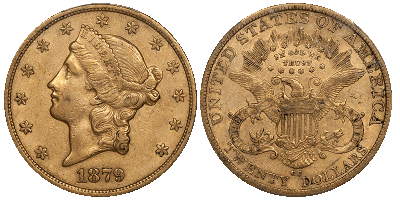 The capped Bust Left Half Eagle type was struck from 1807 through 1812. It is very popular with collectors as each of the six years is available, and a complete set in reasonably high grades could be assembled for around $100,000. 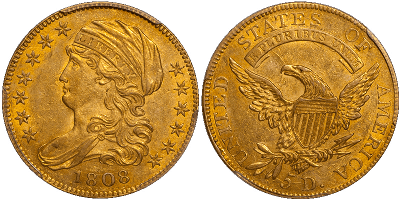 A total of 55,578 Half Eagles were made in 1808, and varieties are known with a normal date and an 1808/7 overdate. There are fewer than 1,000 known in total of these overdates, and this issue is not typically seen in grades higher than MS61 to MS62. An overdate coin is a coin that has been re-engraved to change the date. The new date is added by overlaying one or more numbers on top of the old date. This is a pleasing reddish-gold example with no severe impairments and crisp overall detail. A few trivial marks in the fields preclude a higher grade. This is a nice, affordable example of an important artifact of American history. PCGS has graded 18 examples of this issue in MS61 with 68 finer. The PCGS Price Guide suggests a value of $13,500 for this date in MS61. The $10 Eagle was the highest denomination American coin produced until the $20 Double Eagle began production in 1850. The Capped Bust Eagle coinage was made from 1795 through 1804. The first type, struck from 1795 to 1797, has a Small Eagle reverse, while the second type, issued from 1797 through 1804, has a Heraldic Eagle. This denomination is popular due to its size, scarcity, and beauty. 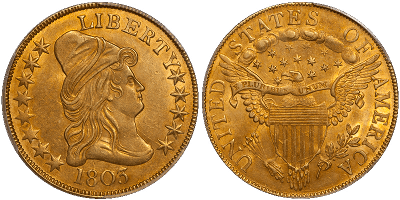 The 1803 is the second-to-last early $10 gold issue, and an estimated 15,017 were struck. It is believed around 400–500 are known in all grades, with maybe one-quarter of these grading MS60 or finer. The 1803 Eagle becomes rare in MS62 to MS63 and extremely rare (and expensive) in MS64 and finer. This is a cosmetically appealing early Eagle with rich, frosty luster beneath rich reddish-gold color. The strike is slightly uneven with some weakness noted, and this is par for the course for such a large gold coin struck during the early days of the U.S Mint. This is a high-quality and very impressive coin that is the epitome of a collection centerpiece. PCGS has graded 13 in MS61 with 35 finer. The suggested retail value for an MS61 is $36,000. No PCGS MS61 has sold at auction since 2008! 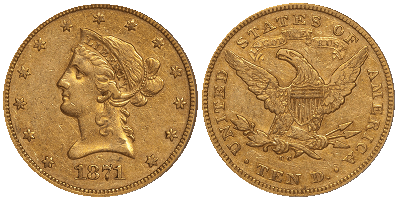 The 1871-CC is the second most available Carson City Eagle from the 1870s, but it is not often seen in EF45, and it is almost never with natural color and surfaces. This is the nicest EF45 example of this date we can recall, as it is wholly original with deep, rich olive-gold and russet toning seen over smooth, choice surfaces. We have seen many 1871-CC Eagles in AU50 and AU53 holders that couldn't remotely compete with the aesthetics of this exceptional piece. Besides this coin (see below for provenance), the only other PCGS/CAC EF45 1871-CC Eagle to sell at auction brought $15,275 back in 2013 in a Stacks Bowers auction. If you are putting together a set of Carson City Eagles and you care about quality, it is unlikely that a finer 1871-CC can be found at this price point. CAC has approved three in this grade with four finer. Ex: Stacks Bowers 2016 ANA ($19,975), Stack's 8/10: 1152 ($12,650), Johnson-Blue collection. The 1879-CC is one of four scarce Carson City Double Eagles (the other three include the 1878-CC, 1885-CC, and 1891-CC) that are legitimately scarce in all grades. The 1879-CC is an especially difficult issue to locate in collector grades, and most of the pieces we have seen in EF45 holders are stripped and very heavily marked. Fresh to the market and recently sourced in Europe, this 1879-CC is a Gem for the grade with rich, natural russet color and immaculate surfaces. Doug says he could have scrubbed this coin and made it into an ugly AU53, but that would have been a numismatic tragedy, as this piece has exceptional eye appeal! The most recent sale of a PCGS/CAC EF45 1879-CC Double Eagle was Heritage 10/16: 3359, and that coin wasn't even close to the present piece from a quality standpoint. A marginal quality non-CAC PCGS EF45 just sold for $15,275 as Heritage 4/17: 16035. If you have been searching for the best available quality for this scarce date at a comparatively affordable price point, this is the 1879-CC Double Eagle that you've been waiting for. CAC has approved 9 in this grade with 12 finer. Uncovering rare U.S. coins like these five gold Eagles is astonishingly remarkable. Gold Eagles of this date range and quality are extremely rare and invaluable assets that any serious investor should consider. If you’re looking to add a truly breathtaking and unique centerpiece to your rare coin portfolio, then this is one of the best opportunities you’ll likely get for a while. Coins like these are quick to disappear from the market and typically don’t reappear for many years. To learn more about adding these rare U.S. coins to your collection, call us at 800-831-0007 or send us an email. *Prices are subject to change based on market fluctuation and availability. Prices reflected are for wire transfer, check, or cash only. Offer expires June 29, 2017.